Free-fix-pc-now.be pop-up is a fake advertisement or software and driver update warning message that is generated by the Free-fix-pc-now.be adware server. 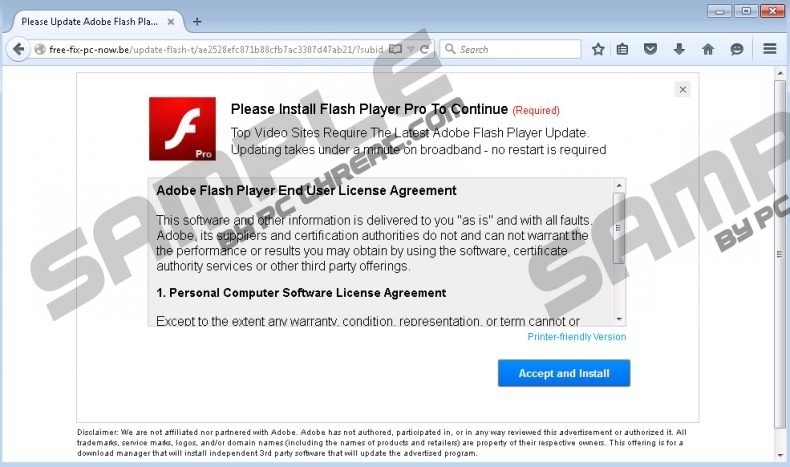 If you happen to see such ads, either your system is infected with adware programs or you visit websites that are connected to this suspicious adware server to display third-party ads. No matter which one is true, these fake ads, which can be pop-ups, banners, or in-text, can easily put your system’s security at risk. You may be introduced to downloaders that may bring more trouble to your computer than you might think. It is essential that you scan your computer for the presence of adware applications since, in order to remove Free-fix-pc-now.be pop-up ads, you need to get rid of all adware infections. The first question that emerges with regard to Free-fix-pc-now.be pop-up advertisements is how adware programs may have entered your operating system. The most likely way for adware to infiltrate your computer is via freeware bundles. Although we have to mention that there are, obviously, legitimate software bundles out there, unfortunately, schemers use this distribution method to deliver malware infections onto users’ computers. Such infected bundles may be downloaded from unreliable and shady freeware hosting websites or torrent sites. These sites can display fake download buttons and links, so if you are not familiar with the page, you may easily be tricked into clicking on them. That is how most users get infected with malware, because most of them rush to install the whole package without double-checking what additional components will also be installed. Since there is a good chance that your PC is infected with adware if you see Free-fix-pc-now.be pop-up advertisements, we advise you to run a reliable free online scanner to see what kinds of infections you may be facing. We are not affiliated nor partnered with Adobe. Adobe has not authored, participated in, or in any way reviewed this advertisement or authorized it. All trademarks, service marks, logos, and/or domain names (including the names of products and retailers) are property of their respective owners. This offering is for a download manager that will install independent 3rd party software that will update the advertised program. By accepting these terms, you practically open the door for more infections and more exposure to cyber criminals. Does that sound bad enough for you? So, please think again when you are facing a Free-fix-pc-now.be pop-up that is trying to deceive you into some essential update download and close the ad. Of course, that will not stop these questionable ads from haunting you. That is why you should make sure you remove all adware applications that may be present on your computer. If you are lucky and there is none, try to stay away from websites that may present to you unreliable third-party ads. The truth is that you may not even know how many adware applications may be on-board. Of course, you can try to remove Free-fix-pc-now.be pop-up advertisements by finding these programs one by one in your installed programs list in Control Panel. Follow our instructions below, if you chose this manual option. But keep in mind that you may not be able to remove every adware program this way, and leftovers may remain on your system. That is why we firmly suggest that you use a reputable antimalware program that will automatically identify all infections and eliminate all the risk factors. In order to protect your computer from similar malware attacks, keep your security tool updated regularly. Press Win+X and choose Control Panel. Click on the unwanted adware application and click Uninstall. Select the unwanted adware application and click Uninstall. Click on the unwanted application and click Remove. Quick & tested solution for Free-fix-pc-now.be pop-up removal.